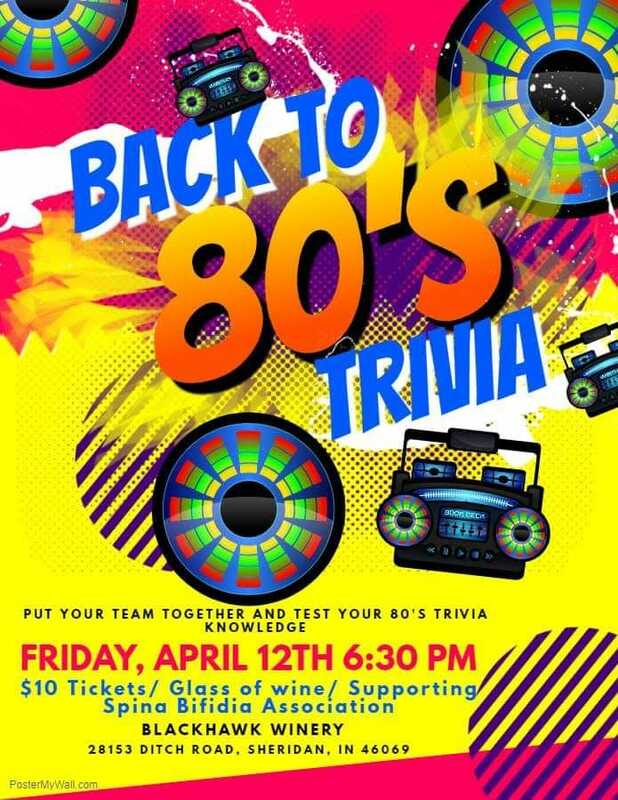 Please join us for Pop the Cork Trivia Night as we go back to the 1980's at Blackhawk Winery & Vineyard to benefit Spina Bifidia Association of Indiana. Hope to see you there! We will have lots of fun prizes, special drinks, and, of course, really tough trivia! Pop the cork trivia is always a good time! $10 registration fee includes a free drink (non-alcoholic or glass of wine) and a donation to Spina Bifida Association of Indiana. All ages welcome. RSVP your trivia team to Beth at popthecorktrivia@gmail.com. When you RSVP, please specify if you will need a non-alcoholic drink.